Learn how to make a recipe for New York Cheesecake. No recipe has ever gained so much fame as this recipe. Although this delectable dessert has been around since the days of Ancient Greece none has been more appreciated than the NY style cheesecake recipes. Today we have thousands of versions of these cakes and pies, many rich tasting ones with nuts, candies, cookies and sauces but none will ever replace your need to know how to make a recipe for New York cheesecake. 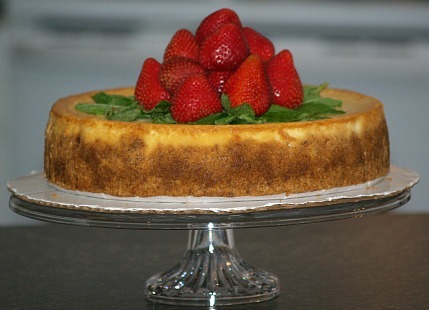 Although cheesecake recipes are popular and loved all over the United States and the world, the recipe for New York cheesecake has earned a reputation for its delicious taste. People from California, Texas, Florida and all states talk about this creamy, smooth, dense dessert. Most of the recipes are for a thick cake and are plainer (still delicious flavor) than ones like for example the peanut butter. They are also traditionally served alone with no fruit or sauce toppings; you just do not need them with this moist delicious flavor. Perhaps the invention of cream cheese in New York back in 1872 is what really boosted the creation of the recipe for New York cheesecake. You will find in the United States this is the type of cheese used in all these luscious desserts most frequently; always in the NY cheesecake recipes. When you learn how to make a recipe for New York Cheesecake you will see that the cheese, heavy creams and additional eggs is what is attributed to the heavier moist texture of this style of cheesecake; similar to custard recipes. Italians make mostly ricotta cheesecake, Germany will use cottage cheese and France is known for its lighter version of cheesecake made with Neufchatel cheese. In small mixing bowl combine and blend butter, 1 ¼ cups flour, ¼ cup sugar, 1 egg yolk and half of lemon peel; cover and refrigerate 1 hour. Press 1/3 of dough in bottom of 10 inch spring form pan; bake 8 minutes and cool. Increase oven temperature to 475F degrees. Beat cream cheese in large mixing bowl on medium until smooth. Slowly add 1 ¾ cups sugar and beat until smooth. On low speed beat in 3 tablespoons flour, 2 egg yolks, remaining half of lemon peel, 5 eggs, whipping cream, orange peel and salt. Increase mixer speed to high and beat 5 minutes. Press rest of dough around sides of cooled spring form pan to within 1 inch of top; do not bake dough. Pour cheese mixture into pan and bake at 475F degrees for 12 minutes. REDUCE HEAT to 300F degrees and bake 35 minutes. Turn OVEN OFF and leave cake in oven 30 minutes; remove and cool on rack. Refrigerate until cold; loosen sides with knife and remove sides to serve. Line 12 inch spring form pan with graham cracker crust and refrigerate. On low speed of mixer cream cheese and sugar; do not over mix. Add flour, salt and vanilla; with mixer on low speed add eggs one at a time mixing into batter. Blend in cream and pour into crust lined spring form pan. NOTE: Place baking sheet under pan and bake on low rack; about 1/3 from bottom. Bake for 2 hours; turn oven off and allow cake to set in oven until cold. Preheat oven to 375F degrees; grease spring form pan with butter. Mix cracker crumbs, cinnamon, ¼ cup sugar and melted butter; press into bottom and on sides of pan. In mixing bowl blend on medium speed cream cheese with lemon juice. Add 1 ¼ cups sugar; add eggs one at a time beating well after each. Pour batter into spring form pan and bake for 25 minutes; remove cake from oven. 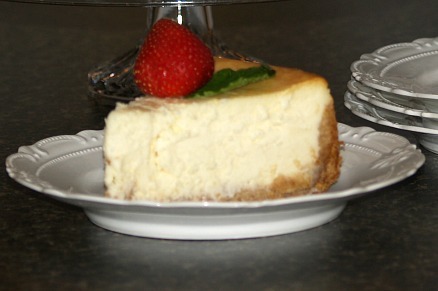 Combine and blend sour cream, 4 tablespoons sugar and vanilla; pour over baked cheesecake. Immediately return to hot oven for 12 to 15 minutes; remove from oven and cool. Remove pan sides and refrigerate for 12 hours. Combine and mix crumbs, 3 tablespoons sugar and butter. Press into bottom of 9 inch spring form pan; bake for 10 minutes. Combine and mix cream cheese and 1 cup sugar. Add flour and vanilla beating on medium speed until well blended. Add eggs one at a time beating well after each; beat JUST until blended. Blend in sour cream and melted chocolate. Pour mixture over crust and bake 65 to 70 minutes or until center is set. Run knife around pan to loosen but leave rim on until room temperature. Remove rim and refrigerate at least 4 hours; top with cherry pie filling to serve. Combine all pastry crust ingredients; blend well. Divide pastry in half and press HALF into 9 inch spring form pan; prick with fork. Bake for 10 minutes; cool completely on wire rack. TO MAKE FILLING beat cream cheese in a large bowl until smooth. Add sugar and beat until light and fluffy; beat in eggs one at a time beating after each. Beat in vanilla and flour until well blended; add sour cream and stir well. Press remaining HALF of pastry crust around the insides of pan to within 1 inch of rim. Pour filling inside the pastry lined pan; bake 40 to 50 minutes until center is set. TURN OVEN OFF and let cheesecake set in oven for 1 hour. Cool in pan to room temperature; refrigerate overnight. To serve remove sides of pan and place cake on cake plate. Decorate with fresh fruit if desired. FOR CRUST combine crumbs, sugar and butter; mix well. Press mixture firmly into bottom of 9 inch spring form pan; bake 10 minutes. FOR FILLING combine cream cheese, flour and vanilla in large mixing bowl. Beat on medium speed until well blended; add sour cream and mix well. Add eggs one at a time mixing on low after each addition just until blended. Pour filling over the crust; bake 70 minutes or until center is almost set. Run knife around edge of pan to loosen cake; cool on rack to room temperature. Refrigerate cheesecake at least 8 hours; remove sides of pan for serving. Top with cherry pie filling if desired; serves 16. FOR CRUST combine crumbs sugar and butter; press firmly on bottom of 9 inch spring form pan. FOR FILLING beat cream cheese until fluffy; gradually add milk beating until smooth. Bake for 1 hour or until lightly browned; cool to room temperature. Run knife around edges to loosen cake from pan; refrigerate overnight. Remove sides of pan to serve; garnish as desired.